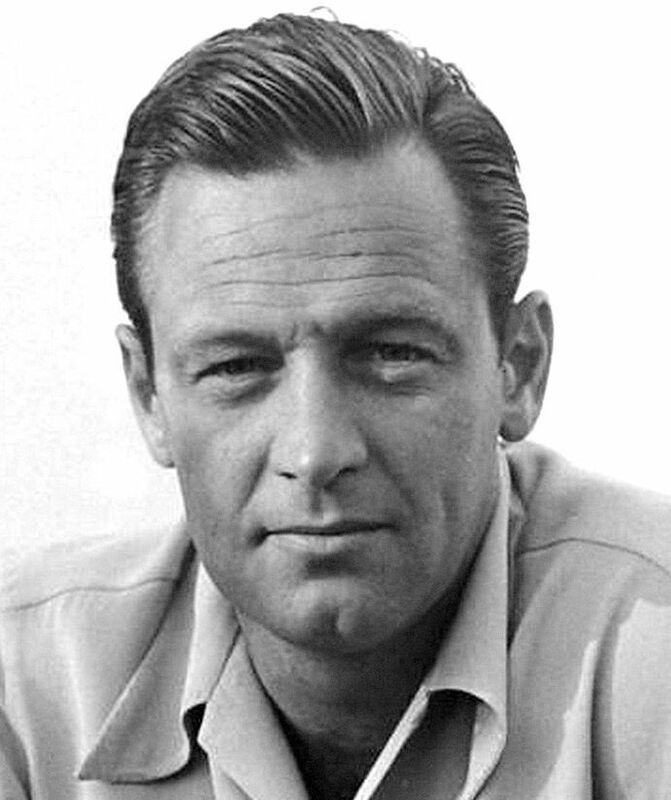 William Holden is a true Hollywood Legend. He had a career that spanned over 40 years. His movies jumped across the different genres. On the screen he conveyed ruggedness, handsomeness, toughness, and cynicism. His screen presence couldn't be denied. He worked with some of the best actors of the Golden Age of Cinema (Gloria Swanson, Judy Holliday, Barbara Stanwyck, Alec Guinness, and Humphrey Bogart) and he held his own. Many of his movies are considered true classics- Sunset Blvd, The Bridge On the River Kwai, Network, and Stalag 17 to name a small few. This April will mark his centennial birthday. 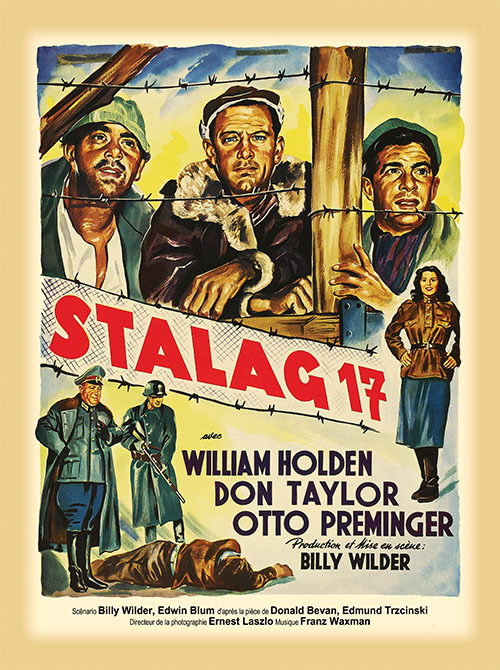 As part of a birthday celebration, I am going to discuss one of his most iconic movies, the previously mentioned Stalag 17. Stalag 17 (1953) is the movie that won William Holden the Academy Award for Best Actor. Set in a German Prisoner of War Camp, the movie is filled with both intrigue and humor. Holden plays POW SGT J.J. Sefton, a cynic. He's a guy who has been a prisoner for some time and has learned how to navigate the ropes of Camp Life. He's decided the best bet for him is to sit tight and make himself as comfortable as possible. No escape attempts for Sefton; the odds are too much of a long shot. In order to make himself comfortable, Sefton has to trade and do business with the German Guards, with the enemy. Of course, this does not make him popular with his fellow bunkhouse mates. The Intrigue in the movie comes by the German Guards always being one step ahead of the Prisoners. The Guards seem to find out their plans and know of hidden contraband and tunnels. How are the Guards always figuring things out? Is there a Spy among the group? Is an American actually ratting out fellow Americans? If so, who is this person? Given Sefton's ability to trade with the Guards and gain privileges and benefits, he naturally becomes Suspect #1. Is Sefton the traitor? Of course he isn't, but I won't tell you who is the actual Spy. Watch the movie! The humor mainly comes from two of the Prisoners named Animal and Shapiro. Animal is obsessed with Betty Grable, and his tears and mooning over Grable never fails to bring the laughs. Be on the look-out for a funny scene between Shapiro and Animal during the Camp's Christmas celebration. Although the movie has a lot of humor, it also doesn't ignore the horrors of war. It shows the horror in the form of a prisoner named Joey. He is a man shell-shocked who only finds comfort from playing an Ocarina. The care and compassion that Joey receives from his bunk mates is very sweet to watch. Stalag 17 was directed by the masterful Billy Wilder. Along with Holden, it also features Otto Preminger, Don Taylor, and a young Peter Graves. A great director, great cast, and a great story makes for one great movie watch. 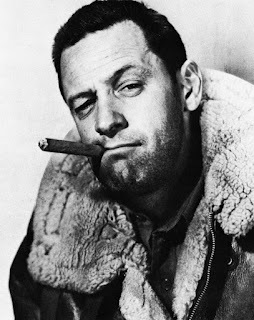 In celebration of what would have been William Holden's 100th birthday, pop in Stalag 17 and have a cigar on Sefton. 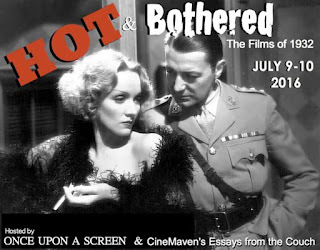 This article is for the Summer Under the Stars blogathon event. On August 15th, Turner Classic Movies will be devoting 24 hours to Roddy McDowall. He has had a career that spanned over 40 years with making the transition from child actor to adult actor. This article will focus on the movie that put Roddy McDowall on the map and brought the world to his attention: How Green Was My Valley. How Green Was My Valley (1941) was a John Ford masterpiece set in a poor Welsh mining town. It centers around the Morgan family. Donald Crisp played the patriarch of the family. Sara Allgood played the matriarch of the family. Maureen O'Hara played the only daughter, Angharad. 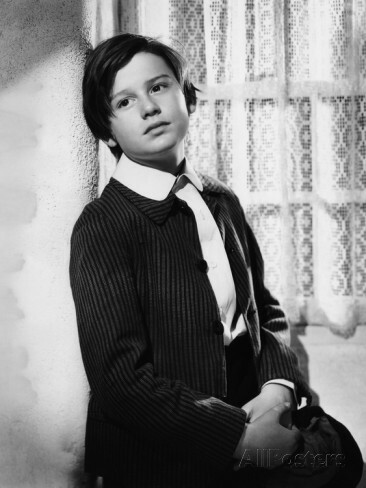 And Roddy McDowall played the youngest son, Huw. Walter Pidgeon also starred as the new town Preacher. The movie is narrated by older Huw, and he tells the story of essentially becoming a man in the midst of a village dying and a changing family. Roddy McDowall was 12 years old when he played the role of Huw Morgan, and he gave a brilliant performance full of sensitivity. Roddy McDowall is one of my favorite child actors of the classic film period, and his performance as Huw is the reason for it. In the beginning of the film, Huw is treated as and seen as the baby of the family. He has no experience outside of life in his village. He has to be a bystander, an observer, as his family struggles and changes due to dangers of working in the mine and lack of fair pay by the mine owners. Things start to change for Huw, when he attends a school in a different village. This school is full of more upper class children. At this school, Huw has to deal with a bullying classmate and a bullying teacher. The way Huw handles these situations has his family starting to see that he is becoming a man. One of my favorite scenes with Roddy McDowall is when two of his elder brothers decided to leave for America for better prospects. Their mother leaves the dinner table heartbroken. It is only Huw and his father at the table. His father sits in silence with his head downcast. Huw gives a little cough, and his father says "Yes, my son. I know you are there." Huw smiles and continues eating his dinner. His father's acknowledgement meant so much. It is a great scene between them. Another scene was when Huw and his mother falls through ice into the freezing water. After they are rescued, Huw overhears that his legs are frozen solid and he may never walk again. The look on that young boy's face, the look in his eyes....that was good acting from young McDowall. Then there is the very last scene of the film. Huw holds his father in his arms. There were no words spoken, and yet much was conveyed in McDowell's eyes. This article is part of the 2016 Summer Under the Stars Blogathon. For the month of August, Turner Classic Movies will devote a day to a particular star. Friday August 5 is Karl Malden's Day. The subtitle of this article is "The Dependable One." An apt description for Malden. When you watch a movie that starred Karl Malden, there is little doubt that you will see a performance that grabs your attention and won't let go. There is little doubt that he will stand toe to toe with some of the best actors of that time and still command the scene. There are many films that one can choose to highlight when talking about Karl Malden: On the Waterfront, Streetcar Named Desire, Gypsy, Baby Doll are just a few. This blog post will focus his performance in On the Waterfront. 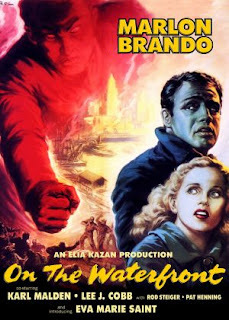 On the Waterfront (1954) was directed by Elia Kazan and is considered one of the best movies ever made. There were many variables that has made On the Waterfront a classic not to be missed: the directing, the music, the film's atmosphere, the writing, and of course the acting. 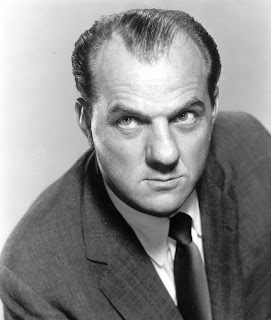 The acting which included a memorable performance by Karl Malden. On the Waterfront is about life on the docks. It's about secrets. Loyalty. Snitching. Standing up for your rights. Marlon Brando plays Terry. He's a fairly simple, easy going dock worker who loves his pigeons and his brother, Charley (Rod Steiger). The docks are run by a local thug, Johnny Friendly (Lee J. Cobb), who isn't afraid to resort to murder to keep control of those docks. Terry has information on a murder that could help put Johnny away. His new girlfriend, Edie ( Eva Marie Saint), happens to be the sister of the victim and wants him to speak out. However, in that neighborhood speaking up and out is snitching. No one snitches. No one wants to be a rat, especially Terry. So on one hand, Terry has his brother Charley, who works for Johnny, imploring him to keep his head down and his mouth shut. No surprise he also has Johnny Friendly stressing that it is important to his health to remain quiet. And on the other hand he has his conscience and Edie telling him he has to do the right thing and tell on Johnny. Not only does he have his conscience and Edie, he also has a Priest on his case. Father Barry has made it his duty to help the dock workers find justice and have their God-given rights enforced. The Father knows Terry has something to say against Johnny Friendly, and he pushes Terry and shows Terry that he has a duty and a responsibility to speak. It's his job as a man to speak up. So who plays this Priest? None other than Karl Malden. 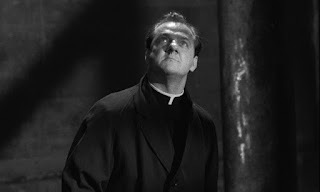 Karl Malden's Father Barry is a tough Priest. He doesn't do his job only in a church. He goes out on the streets. He goes to the docks. Father Barry once said in regards to the Waterfront and Docks: "This is my church!" He is committed to rallying the dock workers to stand up for themselves. Testify against Johnny Friendly. He stands in a room with people booing him and throwing things at him, but he keeps speaking for what he knows is right. He keeps standing up for the little guys. In that memorable scene , Malden showed such passion and righteous anger as Father Barry. He portrayed that Priest to perfection. He truly is fantastic in this movie and absolutely commands the screen. There is also a scene where he confronts Terry in a bar. He is telling Terry that if he truly wants to get Johnny Friendly, then the best way to do it is in a courtroom. Terry says something derogatory and Father Barry knocks him to the ground. Malden was so great in that scene! He wasn't overshadowed. He had such a strong presence. There was strength in his voice and in his body language in both scenes mentioned. Now it should be said, there are some extenuating circumstances connected to those scenes. However, I won't share them, because I don't want to spoil too much. If you haven't seen this movie, then I recommend it to the highest degree. It is truly a brilliant film and Karl Malden is one of the reasons. To go back to the beginning; you know to expect a great performance when you see Karl Malden is in a film. He didn't have the classical good look but he didn't need it. There was power in his performances, and he could do both drama and comedy. He was a tremendously talented actor. Truly one of the greats and definitely deserving of a day dedicated to him on Turner Classic Movies. "This picture is an indictment of gang rule in America and of the callous indifference of the government to this constantly increasing menace to our safety and our liberty. Every incident in this picture is the reproduction of an actual occurrence, and the purpose of this picture is to demand of the government: 'What are you going to do about it?' The government is your government. What are YOU going to do about it?" This damning statement...this essential call to arms appears in the opening credits of "Scarface." When most people hear the name "Scarface" it is a good guess that the first thing or only thing they think of is the 1983 Brian De Palma film starring Al Pacino. That used to be the only film that would pop into my head. It was a surprise to learn that the there was a 1932 version of this movie. And it is obviously this earlier version that is the topic of this blog post. It is this version that had the call to arms in the opening credits. 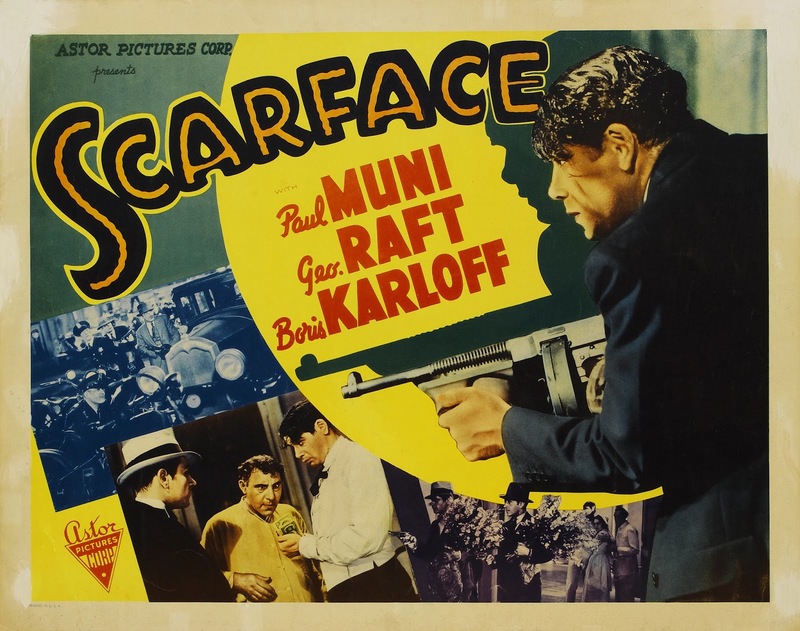 Scarface was produced by Howard Hughes and Howard Hawks, and it was co-directed by Hawks and Richard Rosson. It starred Paul Muni, George Raft, Ann Dvorak, Osgood Perkins ( Anthony Perkins' father), and Boris Karloff. The movie follows the rise and fall of Tony Camonte. Tony has big dreams. He dreams of being top of the world. Top of the gang world to be more precise. His motto in achieving this dream is "to do it first, do it yourself, and keep on doing it." When he shares his philosophy, he points to his gun. So you can infer that he means you pull the trigger first, you pull the trigger yourself, and you keep pulling it until no one stands in your way. With this life philosophy, it isn't surprising that the world Tony inhabits is a very violent world, and the movie does not shy away in showing this violence. The movie doesn't shy away in showing how that violence spills over and touches the lives of the innocent bystanders outside that gang world. We have scenes such as the main character walking into a hospital and shooting an adversary. There are many scenes of drive by shootings from speeding cars with no care for a bystander that could be out on the street. We see a city terrorized by a gang war. So it starts to become clear why there is a feeling of anger in the opening statement of the movie. It becomes clear why there is a demand for action. And what of our main character and those that inhabit his world? As with many movies back in the 1930s, the gangster life doesn't have a happy ending. Tony comes across as a bit of a psycho, who destroys the lives of the closest people to him. Even his own mother said "He hurts everyone." He is obsessed with his younger sister, Tessa, and hates the idea of her being with any man. He is quick with the trigger. Now that is a combination that doesn't bode well. Also he has the Cops after him, and he has enemies waiting to pump him full of lead every time he goes outside. I won't go into specific details as not to spoil too much. This is a very good movie, and I highly recommend it. Even though it premiered in 1932, I think modern audiences will find at least some aspects timeless. There are present day cities still terrorized by violence with a call to action to end it. So immerse yourself into the crazy world of Tony Camonte, Scarface and see how the more things change, the more they stay the same. Let me first say that Turner Classic Movies is my favorite channel. It is the only channel where I feel I can bask in my love of classic films. 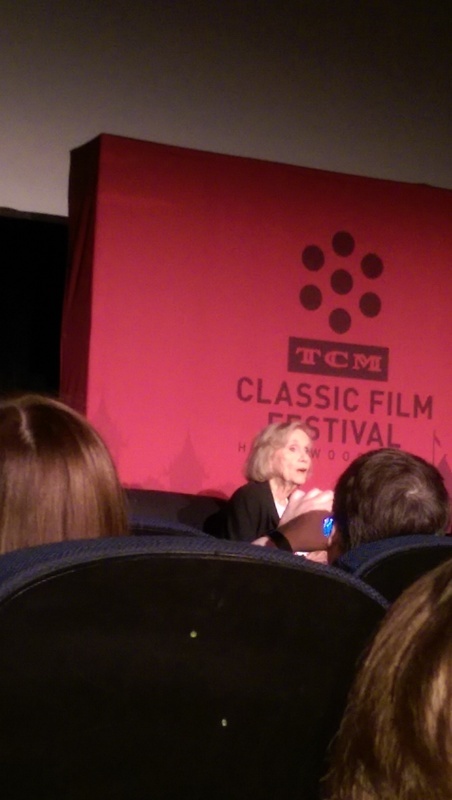 For the past seven years, TCM has put on a festival in Los Angeles for their fans. At the festival, fans can go to screenings of numerous vintage films. 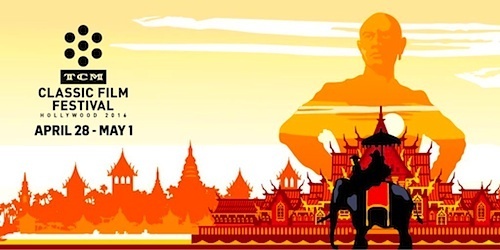 Along with the films, festival goers have opportunities to listen to the actors or writers or directors or any other person who played a part in bringing these films to life. So it shouldn't be a surprise that I have yearned to attend this festival. However, there has always been a major barrier to my going: Money. I simply felt I could not afford to spend the money no matter how much I knew I would have the time of my life. When I joined Twitter, I found a community of fellow lovers of TCM and Classic Movies. I would read their tweets and see their pictures of their time at that particular year's festival. With every account I read, my heart would ache with missed opportunities. Still, every year I kept telling myself that I could not go. 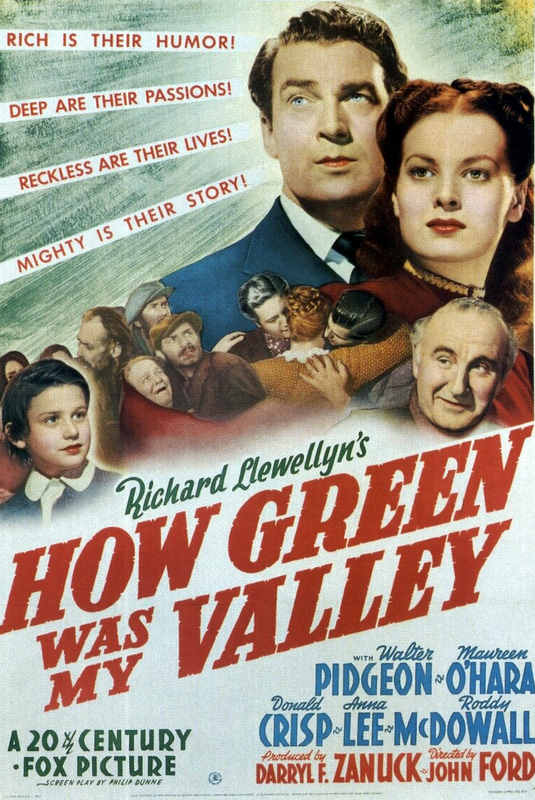 Then Maureen O'Hara attended the festival in 2014 and they screened one of my all time favorites, How Green Was My Valley. I missed that year. Then Maureen O' Hara passed away and I realized I had missed an opportunity to see in person one of my favorite actors at a screening of one of my favorite movies. It hit me more than ever that these legends won't be around forever. I can't keep letting opportunities pass me by. So I really started to save. I made a promise to myself that I was going to attend 2016 Festival. When passes for the festival went on sale, I bought the Classics Pass. A fellow festival-goer recommended a hotel for me. The hotel was in the perfect spot. I was within walking distance of all of the theaters. I booked my flight. As it came closer to my traveling to LA, I started to get nervous. I couldn't believe I was going. I couldn't believe I actually spent so much already and I hadn't even gotten to LA yet. When I arrived in LA the nervousness went away. My very first time in LA! I arrived the day before the festival officially started. I dropped off my bags and I started to walk around. Without even realizing it, I had found my way to Grauman's Chinese Theater. 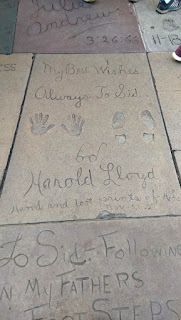 I saw the hand prints and foot prints of actors I have admired my whole life. 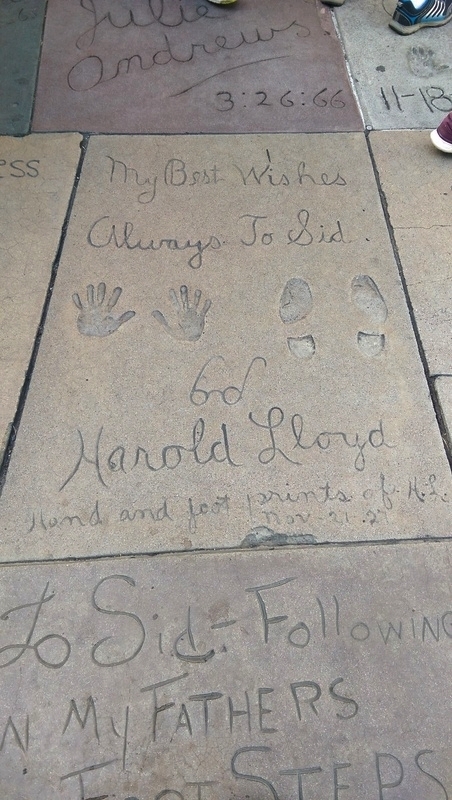 I actually stumbled upon Harold Lloyd's prints and he is my favorite Silent Film Star. I walked around that little area and read the inscriptions and noticed the dates. The dates ranged from 1920s, 1930s and on and on til today. Amazing! I walked up and down Hollywood Blvd looking at the Walk of Fame. I found Spencer Tracy whom I have loved watching since I was 9 or 10 years old. I walked around and looked at the people. Every person that I saw on the streets, I wondered if they were there for the festival as well. Were they just like me? I made my way to Roosevelt Hotel. 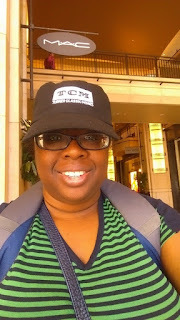 A smile broke out on my face when I saw the signs for the TCM Film Festival posted on the hotel. I had arrived. I had truly arrived. I received an information packet which included a schedule. Oh boy. That schedule. Talk about making hard choices. There were so many interesting and rare films. Many playing at the same time. What to do? How to decide? I wanted to see everything. The first evening of the festival, they showed "A Tree Grows in Brooklyn" with actor Ted Donaldson in attendance. And following that was a screening of "Guess Who's Coming to Dinner" with Katharine Houghton in attendance. Two of my favorite movies. 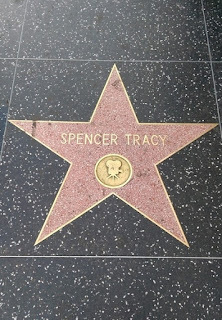 One which starred Spencer Tracy. And boy it was an absolute treat listening to these actors speak of their experiences in making their respective films. In particular with Katharine Houghton. Listening to her speak of her experience was an eye-opener for me. I have seen this movie many times over, but I had never really stopped to think what it was like to actually film it during the late 1960s. Also I attended screenings that had guests Carl Reiner, Angela Lansbury, and Eva Marie Saint. Fantastic! These 3 legends are in their 90s and yet they were of clear and crisp mind. They were funny. So full of life. With each guest interview I had the privilege to attend, I learned what it was like to make the movies that I have loved for years. I got to hear it with my own ears and see with my own eyes. In person. During the Festival, I had the opportunity to attend a session on Vaudeville. I saw clips of films that haven't been seen in over 80 years! How incredible is that?! It highlights the importance of preservation and restoration. It would be a shame to forever lose this part of our history. Also during this Festival, I had the opportunity to meet people who love these movies as much as I do. It was like we were in our own world during those 4 days. I felt part of a tribe. It was a community and I loved being a part of it. 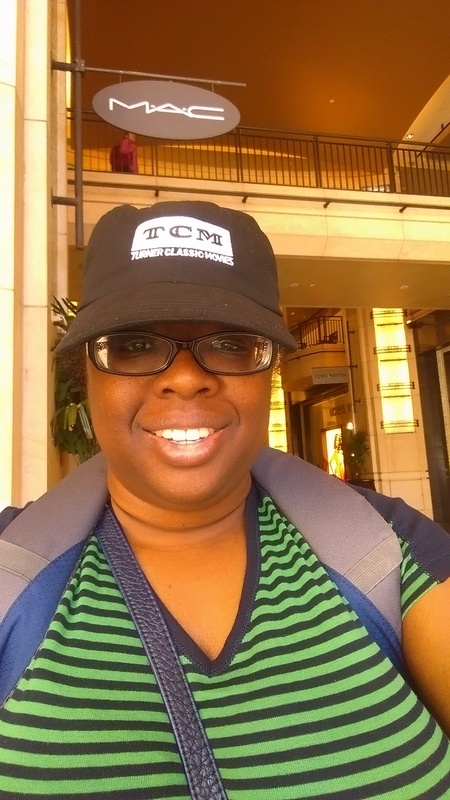 TCMFF 2016 will not be the last for me. I have finally experienced it and now cannot stop at just one. Stephen Reginald (@ Classic Movie Man ) nominated me for the Liebster Award. This is the first time I've ever heard of this, but I feel honored that he thought of me! So the rules are that I must answer 11 questions that my nominator composed to me, tell 11 things about myself that readers don't know, nominate other bloggers and pose 11 questions to them. So here we go!!! 1. 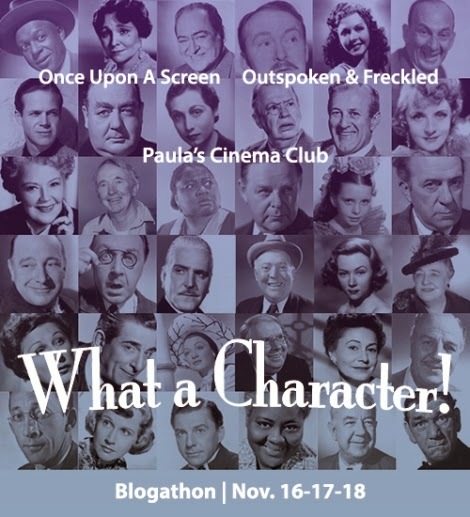 Screwball Comedy, Film Noir, Musical or Western? Tough to answer. I love them all. But if I must choose then....Screwball Comedy. 2. Jean Harlow, Marilyn Monroe or Lana Turner? 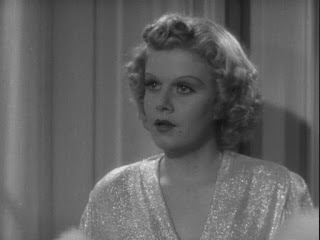 Got to go with Jean Harlow. 3. What film do you think is the most overrated of all time? Hmm...this is difficult to answer. If I had to choose, I guess I would pick "Slumdog Millionaire." 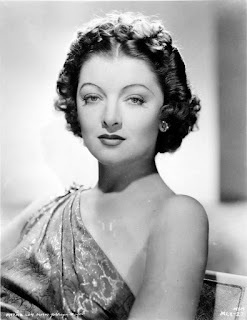 4. Who is your favorite film star and why? If I had to choose just one then it would be Spencer Tracy. He has captivated me since I was a young kid. He had a strong screen presence. He came across as such a natural. He was versatile. And in his performance in "The Old Man and the Sea" he showed just how captivating he can be with only himself. 5. Do you have a favorite movie line? If so, what is it and what movie is it from? My favorite line comes from "How Green Was My Valley." The quote in the movie is part of the narration that originally came from the book the movie is based on. The narrator says "Men like my father cannot die. They are with me still, real in memory as they were in flesh. Loving and beloved forever. How green was my valley then." 6. Cheesecake, apple pie or hot fudge sundae? Ack! The most difficult question to answer! Chocolate Mousse cheesecake. 7. What movie star’s work do you think should get more attention? I wish today's generation would learn of Myrna Loy and watch her work. 8. What was the first film you remember seeing in a movie theater? 9. How old were you when you realized you loved movies? I think I was 9 years old when I realized movies were more than just simple means of entertainment to me. 10. 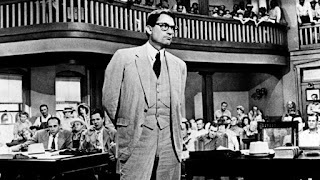 What is the best novel-to-screen adaptation, in your opinion? "To Kill a Mockingbird" hands down. 11. Is there a movie you haven’t seen that would surprise us? "Camille." I want to see it, but something always seems to prevent it. 3. I attempted to learn to play Rugby once. 4. I studied abroad in Russia for 3 months. 6. "All Quiet on the Western Front" and "Brideshead Revisited" are two of my favorite books. 7. I once dressed up as Charlie Chaplin for Halloween. 8. On my college dorm wall, I had a poster of Spencer Tracy. 9. Eggplant parmesan is one of my favorite dishes. 10. Superman was my favorite superhero as a kid. 11. West Side Story was the first soundtrack I bought. 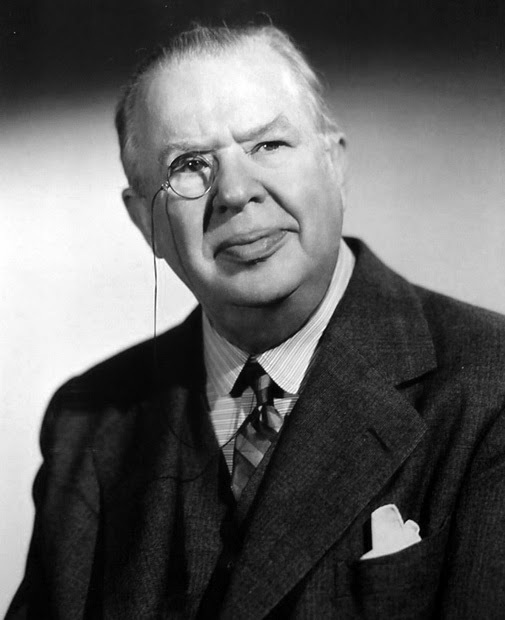 Charles Coburn: What a Character! Coburn portrayed Barbara Stanwyck's father, "Colonel" Harrington. Harrington is a con man card shark who taught his daughter well the art of fleecing unsuspecting marks. They set their eyes on naïve Charles Pike(Henry Fonda) as their next mark. How disappointing for professional con Harrington when his daughter ends up falling in love with Charles Pike and protects Pike from her father’s card tricks? 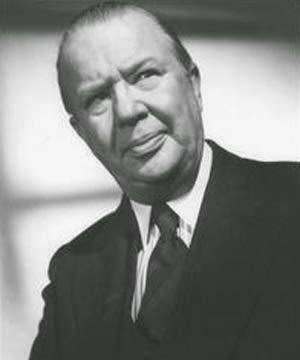 Coburn played Connie Fuller's (Anne Sheridan) rich uncle Stanley. 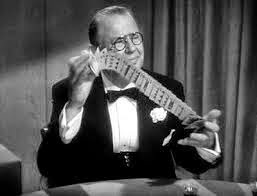 Whenever he arrives for a visit Connie and husband, Bill (Jack Benny), are sure to cover the living room with numerous pictures of good old Uncle Stanley. After all, they want to make sure rich Uncle Stanley knows just how much they love him. In dire need of money to save their home, the Fullers turn to Stanley who is their only hope. Imagine their shock when they discover all is not as it seems with Uncle Stanley’s fortune. In his Academy Award Winning role for Best Supporting Actor, Coburn portrayed millionaire Benjamin Dingle. Dingle arrives in Washington DC as an Advisor on how to handle the housing shortage during WWII. However when he arrives in DC, he discovers his hotel room isn't ready. He answers the ad of Connie Milligan(Jean Arthur), who is seeking a roommate. She sublets him half of her apartment, and they have to learn how to live in this shared space despite having different personalities. Things get even more complicated( and funny) when Dingle sublets half of his half to Sgt. Joe Carter (Joel McCrea). 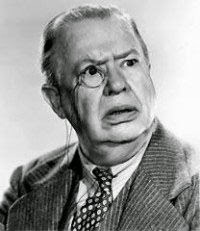 Comedy may be the genre Coburn had the most roles, however that does not mean he didn't foray into other film types. In fact, one of his most memorable roles is in the drama "King's Row." In this movie, Coburn portrayed sadistic doctor Henry Gordon. Dr. Gordon is rumored to perform surgery without anesthesia. His daughter, Louise(Nancy Colman) is in a relationship with rich boy Drake(Ronald Reagan). When Drake's fortune is stolen, he goes to work on the railroad. When he gets injured, vindictive and sadistic Gordon needlessly amputates both of Drake's legs out of hatred. This was a far cry from the harmless, lovable characters he was known for playing. 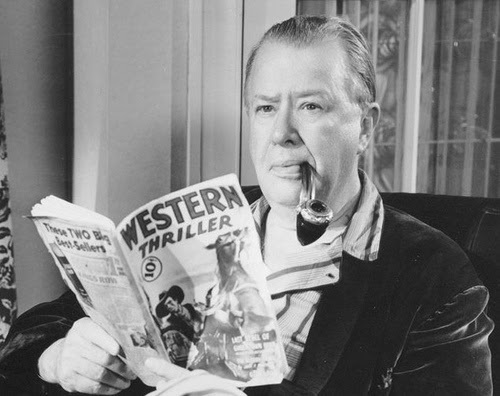 In each of the films listed and many more unlisted, Coburn had a presence about him. He was a familiar face that audiences loved to see. Even fans of today get a real pleasure from his performances. A character actor that was always reliable to bring out the best.